GFXBench offers us some real important information about the smartphones which are not released yet.Today it shows us a mysterious smartphone that has a screen resolution than the QHD but not by much, ie 2880 x 1728, but with limited size, ie 4.6 inches. The SoC is a MediaTek MT6795 , an octa-core ARM Cortex A53 architecture with 64-bit and frequency 1.9 GHz and GPU PowerVR Rogue G6200. A complete specification there are also 3 GB of RAM, 32 GB of internal memory, 5 megapixel front camera and Android 5.0 operating system as Lollipop, while lacking for some reason the camera back. 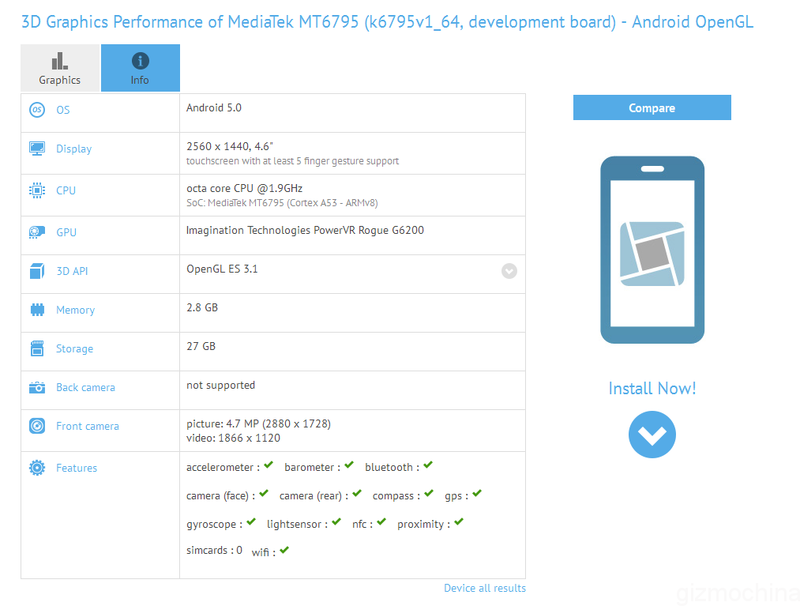 The model is called k6795v1_64 and it is likely that this is a testing device of some company, or maybe even MediaTek to show the potential about MT6795. In any case unlikely we will see it on the market, as confirmed by the absence of the second camera, but it is said that in the near future will not be presented like a smartphone.